Dialog Axiata PLC announced this week the connection of Sri Lanka to the ultra-high capacity 100G-Plus Bay of Bengal Gateway (BBG) submarine fibre optic cable via its state-of-the-art Cable Landing Station (CLS) at Mount Lavinia. 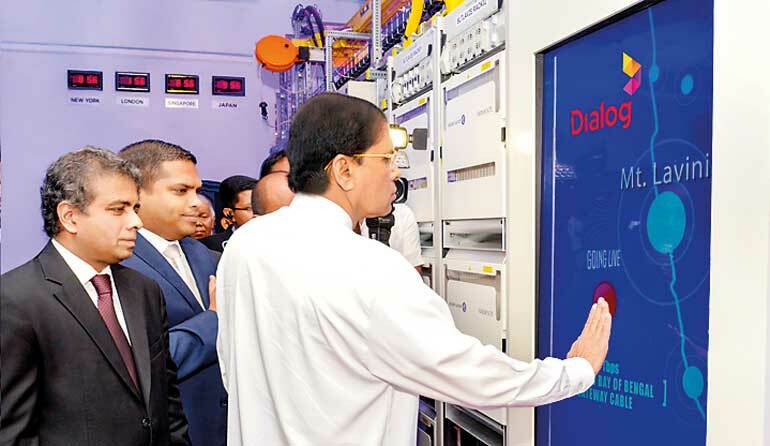 The ultra high capacity submarine cable was commissioned on 30 May by President Maithripala Sirisena in the presence of Minister of Telecommunications and Digital Infrastructure Harin Fernando and other telecommunications and ICT sector luminaries. Dialog’s BBG CLS now links the nation to one of the world’s most technologically advanced cable systems and powers up the single largest global bandwidth infusion to the country. Dialog’s investment in the BBG Cable Project exceeds $ 34.5 million (Rs. 5 billion) and underscores the company’s aggressive commitment to deliver the fastest and most advanced connectivity technology to all Sri Lankans. Dialog’s vision for the provision of high speed connectivity is underpinned by its ethos of maximising digital inclusion via ensuring that the advanced services the company delivers are affordable and accessible to all Sri Lankan citizens, thereby maximising its contribution towards the socio-economic development of the nation. The new cable system will deliver over 6.4 terabits per second of international bandwidth to Sri Lanka, and will represent a significant step-up with respect to connectivity speeds and will furthermore catalyse an unmatched connectivity experience coupled with a multiplicity of networking options for retail consumers and enterprises. In addition to providing Sri Lanka’s connectivity eco-system with the single largest infusion of International Bandwidth, the BBG cable will also infuse further speed and capacity to Dialog’s state-of-the-art 3G HSPA+, 4G and fibre optic networks. The BBG investment also exemplifies Dialog’s commitment to present the best in connectivity and enterprise solutions to Sri Lankan businesses. Dialog recently launched Cumulus, its best-in-class business cloud services portfolio, which will be further strengthened in terms of global connectivity via the BBG. Furthering its role as an industry leader in the provision of international gateway services, Dialog will also extend the benefit of connectivity to high-speed internet bandwidth delivered via the BBG CLS to other telecommunications service providers in Sri Lanka. “Dialog is proud to connect Sri Lanka to its first 100Gbps-plus submarine cable, the largest ever infusion of international bandwidth into the country. The BBG presents numerous advanced and connectivity options, guaranteeing the fastest connectivity to Asia-Pacific, Europe and beyond. Having spearheaded technology transformation in Sri Lanka, we are privileged to further enrich communication technologies and connectivity for all Sri Lankans and enterprises,” said Dialog Axiata Chief Operating Officer Azwan Khan. Alongside Dialog Axiata, the BBG cable is co-owned by a group of high profile tier-1 global telecom operators including Vodafone, Reliance Jio Infocomm, Telekom Malaysia, Etisalat Group and Omantel.